It's overwhelming and frustrating to better operations when performance information is all over the place. Data comes from all departments, processes can differ among heads and you're trying to keep your head above water with everyone as you search for improvement solutions. ERP is often the answer, but it can get complicated and costly. Is there an affordable way to get accurate data that you can be utilized by the front line and upper management? A way to bridge gaps that create room for improved operations? Vizion Solutions has been providing data analytics that grow the top line, improve profitability, increase productivity and manage risk for over 15 years. Our tools offer you a way to harness the power of your data and make measurable changes and improvements. How do you capitalize on growth opportunities, better your performance numbers and find gaps that may be costing you? Business Intelligence. Data automation is a key component in optimizing your opportunity and leads to better resource allocation. Vizion360 Impact Analytics is a Microsoft Power BI solution that can save you a lot of hours and a lot of overhead. 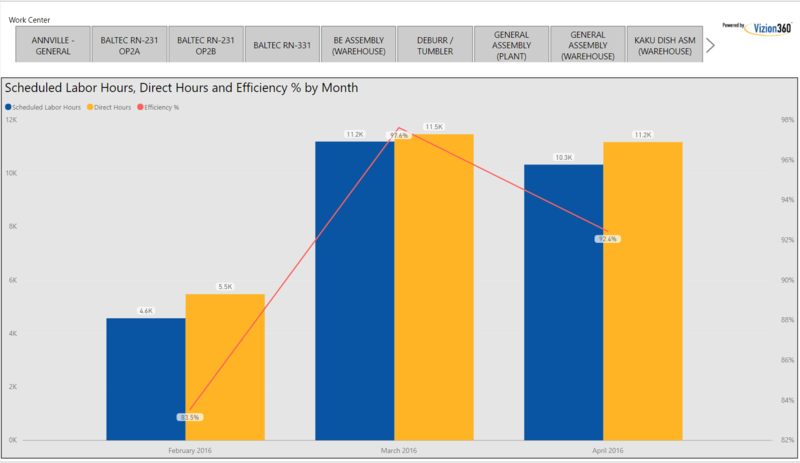 This interactive report shows scheduled labor hours, direct hours, and efficiency by month. Drilling down by employee, month and even product or customer allows for better identification of gaps and opportunities. Have you ever been sent a data spreadsheet that holds too much jumbled information and takes hours to analyze? Don't worry, we have an app for that. Our solutions are separated and custom by areas of focus: Supply Chain, Customer Focused, Customer/Product Profitability and Financial. Each solution includes apps that allow for even more focus. Supply Chain, for example, has analytic apps for manufacturing, inventory and purchasing. Keep your team on the same page through sharing dashboards. Monitor the pulse of your business with key business metrics. Explore and analyze through posing questions that are answered in reports. Connect all of your data to ensure the integrity and keep everything up to date. Drill down into your data to find underlying issues. Bob Hanzie, CFO of Libra, says Vizion "has allowed us to improve our operations". See how you can better your operational efficiency by reading this case study. Learn More on Solutions that Will Work for You!